Lovely is . . . .
How does your current wardrobe measure up to your idea of lovely? What’s lovely and what isn’t? Cultivate and refine your taste, and keep it from being swept aside by fashion and abundance. Focus on what is lovely, not what’s available. Nature. Gaze on the beautiful scenes of God’s creation. Flowers. More of the same, just more specific. Consider the lilies, in more ways than one! Color. Look at color wherever you can. What colors and color combinations look lovely to you? Your favorite things. Take inspiration from your favorite things: colors, patterns, textures, flowers, pictures, furniture. Whatever you love. Clothing and outfits. Finally (and not first! ), look at actual clothing and complete outfits. Online shops and Pinterest are great for this. Find stores that speak your language and learn. Consciously pursue inspiration that fits your principles, values, and tastes. Look at things that look lovely to you and learn from them. My definition of a lovely wardrobe probably isn’t exactly like yours. We each have our own tastes. Sometimes, even things we think look lovely just aren’t us. They’re not our style or maybe they would look terrible on us. Defining your personal style can help you clear out possibilities that won’t contribute to a lovely wardrobe. The loveliest garment ever might not look good on you. A so-so piece of clothing might make you look the loveliest ever. Your body size and shape, as well as the way all your features are put together, are important factors. Wearing colors that suit your eyes, hair, complexion, and personality will go a long way toward creating loveliness. This goes along with #3, but it’s more than just being inspired. “Oh, that’s lovely” doesn’t create a lovely wardrobe! Go beyond that. Seek to understand what you see and what you know of yourself, and how those things work together. Browse Pinterest and pin things. Create a secret board and critique every image, reminding yourself of how you could use the idea in your own wardrobe. Browse or use resources like Polyvore. Bookmark sites that are helpful to you—stores that offer your kind of lovely, or inspiration sources that fit your style. Bookmark individual ideas and organize them in categories (for example, would wear this, might wear this, love this, like something about this, etc.). Just be aware that this is a short-lived solution. Clothing you’ve bookmarked will soon be out of stock and that usually means the picture will be gone. Still, in the short term it can be a good way to sort and organize ideas. Just take notes or pin them when you’re done. 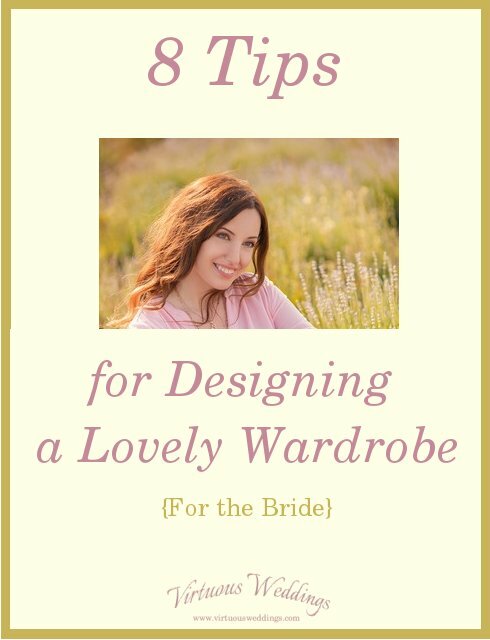 Plan a wardrobe that will fit you well, that will be practical and serve your needs, that will look good on you, and that you think is pretty. Plan for what you need in order to achieve that while still being reasonable. Then, as you are able, work from where you are to where you need to be in order to have a lovely wardrobe. It’s not all going to happen at once unless you have a fat bank account, a personal stylist, and a personal shopper. 😉 I’m pretty sure you don’t, so just move forward intelligently, as you are able to. 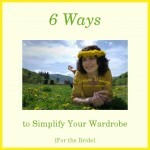 While you’re on the subject of wardrobe planning, check out 7 Tips for Creating a Modest Wardrobe. I included a few resources in that post that you’ll find helpful.